For many McMaster students, the bridge spanning Cootes Drive is a road seldom travelled. The far west side of campus is currently home to just the Campus Services Building, a few baseball diamonds, and several parking lots. But a group of McMaster professors plans to change that. Coming from departments ranging from Environmental Science to English, they call their budding project the “MACMarsh.” In 2009, the City of Hamilton tore up part of west campus’ Parking Lot M to install a Combined Sewage Overflow tank, and it has yet to be repaved. The MACMarsh group is encouraging the university to remove the asphalt that remains and let nature reclaim the barren ground. The parking-lot-to-paradise transition would both increase the amount of campus green space and create a valuable teaching and research facility. Lot M was first created in the early 1970s, when McMaster was facing an impending parking crisis. Projections at the time indicated that the number of motorists would increase dramatically. Fortunately, Mac had purchased 160 acres of wetlands from the Royal Botanical Gardens in 1963, including the Coldspring Valley Nature Sanctuary. Anticipating a need for much more parking, McMaster cleared the Coldspring Area, rerouted a nearby creek, and built several new parking lots. Yet the anticipated parking demand never materialized, and a 2011 study found that now just 2,803 of McMaster’s 3,963 parking spaces are needed, even at peak demand. “Because of increases in bike use and people walking and public transit, there’s been a big decrease in the number of cars on campus,” said Mike Waddington, a professor in the School of Geography and Earth Sciences. Waddington is the Associate Director of the McMaster Centre for Climate Change and one of the professors leading the development of MACMarsh. A greener welcome to Mac is not just a tangential benefit of MACMarsh. It would also help to fulfill McMaster’s long-held goal of minimizing impact on Cootes Paradise, environmentally and aesthetically. This vision of MACMarsh as a peaceful, pretty place in addition to a research and teaching facility has attracted people from a wide range of faculties. Daniel Coleman, a professor of Canadian literature in the English department, says the project can be an asset to the Humanities as well. One of his projects involves writing extensively about one small part of Cootes Paradise. “I wanted to see how much I could learn from one area,” he said. Coleman also believes that Humanities involvement can benefit the project. Students, too, have a role to play in the project; in fact, Waddington says that MACMarsh is being developed primarily for them. Already, several undergraduate students are involved: Hillary MacDougall, a fourth-year Geography and Earth Sciences student, spent part of her summer working at Lot M.
“You learn about digging wells and stream monitoring, but when you’re actually doing it, it makes so much more sense… I think [MACMarsh] would be a really good opportunity for students to take learning from the classroom and apply it to the outdoors and ‘real-life’ things,” she said. Waddington added that these kinds of opportunities would extend beyond the Faculty of Science, and that as many as a dozen courses that could make use of the facility have been identified. At this point, MACMarsh is very much in its infancy, and on-site development is at least two or three years away. The project received a Forward With Integrity grant last May to fund the installation of wells and meters that measure aspects of the area such as water flow. Waddington is optimistic that the project will attract philanthropists in the future. He points to a similar venture undertaken by the University of Ohio that has proved very popular with donors. 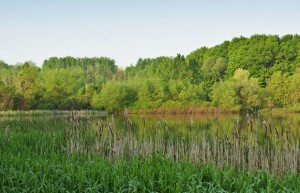 “[McMaster] would be the first [university] in Canada, and only second in the world, to have a research wetland on its campus,” he said when asked about the financial needs of the project. As for the Marsh’s effects on its residential neighbours, that’s a facet of the project that has to be examined carefully. “Before anything would begin it would be very important, obviously, to go through formal designs and discuss it with the public,” Waddington commented. He further indicated, though, that he believes most people would rather live next to a naturalized wetland than a parking lot. “It would be interesting to track public perception throughout time,” he said. McMaster was planning to repave the disturbed part of Lot M and reopen it for parking, but those involved with MACMarsh are optimistic that this intention will be reversed in light of their project. In a few years, current first year students might be enjoying their lunch beside a pristine, on-campus research marsh. As it develops, everyone will have a part to play: from Earth Scientists and English professors to students and community members. Coleman sees this interdisciplinary, intercommunity cooperation as a chance to learn and grow. The best of both worlds: nature and art!